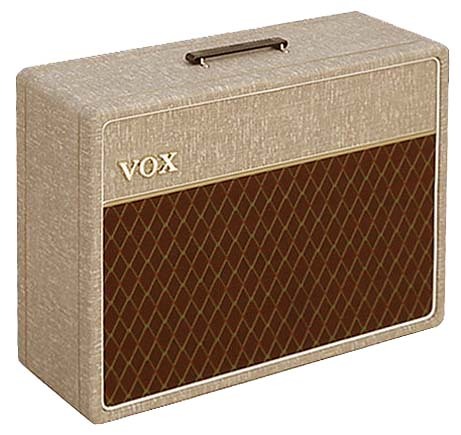 Authentic reproductions of the open backed AC-30 enclosure, manufactured by North Coast Music, authorized and licensed by Vox Amplification, Milton Keynes UK. The cabinets are constructed from 3/4" baltic birch, featuring gussetted locking half lap construction with bolted baffles. Just like the originals, no plastic corner protectors are installed. A single NCM-074 handle is also included. The speaker connection uses a three pin male XLR jack, as used by JMI Vox in the 1960s. 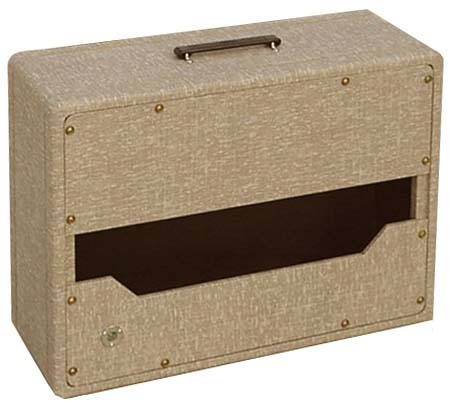 VAP-045F - AC-30 Enclosure - No Speakers - Open backed backed fawn AC-30 cabinet without speakers. Dimensions: 20.5" tall, 27.25" wide, 10.5" deep, less stand. About 40 pounds less speakers. VAP-30FCB - Closed Back Option for NCM-045 and NCM-046 AC-30 Cabinets (replaces individual open fawn back panels with a solid back). This solid back is made from 3/4" 13 ply baltic birch plywood, covered in matching vinyl, that has been milled around the outside inner edges to fit flush into one of our AC-30 cabinets. Must be purchased in conjunction with as NCM-045F cabinet, and is not offered or sold separately. Not pictured.